Kākā. Photo: Duncan Watson, New Zealand Birds Online. What is the rarest breeding bird in Abel Tasman National Park? I think there are several contenders: fernbird, banded rail, falcon and kākā (if someone were to find breeding blue duck they would almost certainly take the title). 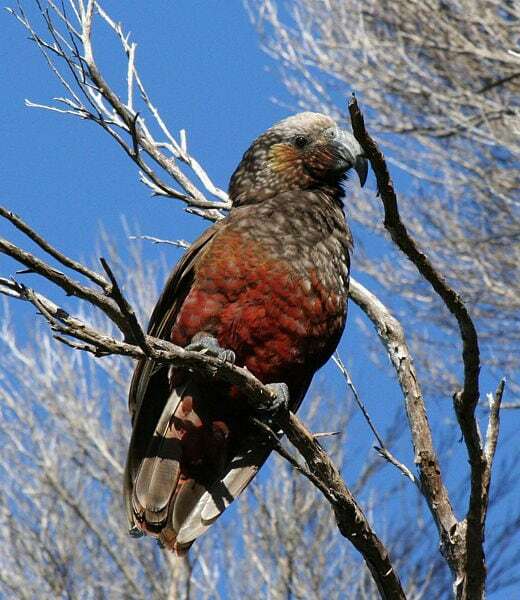 My bet is that there are fewer breeding kākā in the park than any of the other species. We now know that kākā, which nest in holes high in the canopy, are preyed on by stoats and possums. Video footage shows that not only are eggs and chicks eaten but the adult bird is usually cornered in the cavity and also killed. And because it is inevitably the female bird which is killed, the survivors are predominantly male. And because kākā are long-lived we still get to see a few birds (mostly in the high country at Canaan or along the Inland Track) even though the population is effectively extinct. 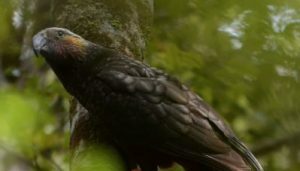 There was some fascinating research done at Nelson Lakes National Park in which the hypothesis was that kākā were declining because wasps were competing for the honeydew and nectar. Supplementary feeding was thought to be the answer. Birds took the extra food and bred but every single nesting attempt failed because of predation. 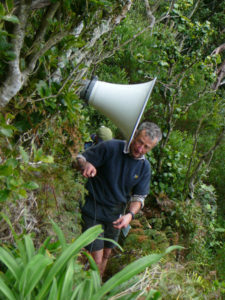 Subsequent trapping of stoats and possums over 5000 ha as part of the Rotoiti Nature Recovery Project [PDF 0.5 MB] was fortunately able to reverse the decline. Can we do anything for the recovery of kākā in Abel Tasman? 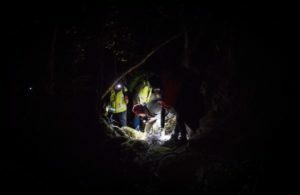 Regular control of possums and stoats has been happening in the high country for some years now and stoat trapping is now intensifying the effort. If kākā were to breed up there its likely they would be successful. But with few if any females still surviving the recovery may need some sort of kick start. Releasing more birds into the park is an option. Work at other sites has shown this to be successful even when there are no birds present to start with. Our intention is to have regular ‘soft’ releases of young birds that have been raised in captivity. By ‘soft’ I mean holding the birds for a short time in an aviary in the park, getting them used to the site and used to supplementary feed. These techniques and hopefully the attendant curiosity of the resident old boys might help to ‘anchor’ the juveniles to the site when the door is eventually opened. That’s the dream. A lot of work to do in the meantime; ensuring that the birds held captive in various institutions are able to provide the young we need and ensuring that Project Janszoon can get a wide-scale, effective pest control operation underway throughout adjacent lowland areas in the park.